Bueno mi gente! Las Fiestas de la Calle San Sebastian are here! From Thursday, January 15th, through Sunday, January 18th, y'all know the drill. Old San Juan. Calle San Sebastián. Go early. Leave late. Dance like a crazy person. Drink in moderation. Pasa la llave. Have some fun! Follow the link to get an Itinerary for what's happening during Las Fiestas. ¡Que lo disfruten! That’s right! Goat Festival! Can’t get better than that! Come and support our local farmers at this amazing goat farm where all kinds of fun stuff will be going on. Great for a family outing. This weekend also brings us the 4th annual Condado Culinary Fest! El Vocero wrote about it here. What a better way to do something nice for someone else than by eating and drinking the night away??? 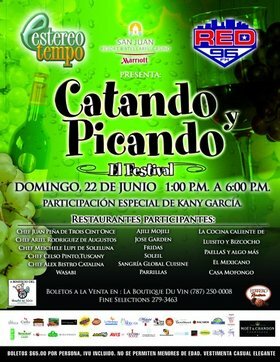 Catando y Picando – El Festival is this upcoming Sunday, June 22nd @ the Marriott Hotel in San Juan from 1:00-6:00PM. $65 gets you delicious food from PR chefs, yummy wines, live music from Kany García, and a good feeling for helping out an awesome cause. 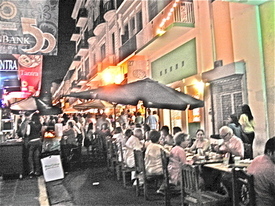 Yesterday marked the end of the 4-day SoFo Culinary Fest in Old San Juan. moncheoPR made its way through the streets and this is what we experienced. NO SE OLVIDEN: Hoy jueves comienza el festejón en SoFo!! butts to SoFo this week/weekend. El Nuevo Dí­a reported on it YESTERDAY in the Por Dentro section. They also included a link to a handy MAP of the area listing participating restaurants. Printealo y sal a monchear! help keep the area clean and dispose of garbage properly. ¡Apoyar lo nuestro incluye cuidar el ambiente! ¡Buen provecho! 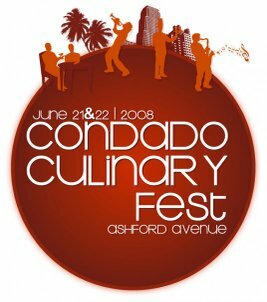 *Pendiente: June 21st & 22nd we have the Condado Food Fest! More info. coming soon. Eventos: ¡Top Chef en Puerto Rico! ¡WEPA! 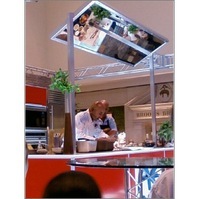 Tonight’s episode of TOP CHEF on Bravo marks the beginning of the 2-episode finale filmed right here in PUERTO RICO. Last month the Top Chef cast and crew arrived on the island and got cooking with local ingredients and food. Tune in @ 9PM to Bravo and let’s see how the chefs handled el calor Boricua. moncheoPR has an exclusive interview in the works with a very important member of the production crew from TOP CHEF. Can you guess who’s the Top Chef talking to moncheoPR? Hint: he or she was a FORMER contestant from Season 1. Stay tuned to moncheoPR to find out! Mark your calendarios! SoFo Culinary Week starts next Thursday, June 5th through Sunday, June 8th. On Thursday, May 22nd moncheoPR found themselves once again @ Plaza checking out the evening Chef presentation during their annual Plaza Food Fest. That night we found our old friend Chef Enrique Piñeiro from Operación Chef on stage. He had a very special assistant with him: Papo Rosario from El Gran Combo. Must be nice!